The Industrial Internet of Things (IIoT) is the application of the Internet of Things (IoT) in an industrial setting which applies smart technology (smart sensors), data collection/storage, and cloud-based analytics connected together using the internet’s infrastructure to achieve value added performance within an industry’s enterprise. IoT is the interconnection of smart devices that monitor, inform, and enhance personal aspects of everyday life via the internet. 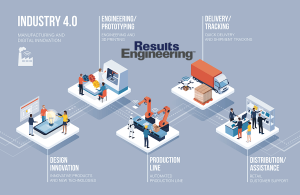 IIoT, in a similar way, builds on the same technology and concepts as IoT to provide the ability to connect businesses, people, machines, data, and devices within an industrial setting specifically targeted to enhance the performance across the manufacturing value chain. For example, the robotic arm on an assembly line, a thermostat in a freezer delivery truck, or a pump that provides fresh water are all connected providing and sharing data to make informed real time data driven decisions that better control the process they are part of. IIoT technology can be applied to solve difficult logistic, manufacturing, and supply chain issues that benefit both the manufacturer and consumer. Leveraging IIoT in an existing enterprise is a mutually beneficial aspect of IIoT implementation and can reduce operational costs while ensuring the highest quality possible in a wide variety of an industry’s processes. Before a process, plant, system, or enterprise can qualify to be part of the Industrial Internet of Things, they must fit into four categories. The first category is interconnection. There must be interconnection between sensors/algorithms and the operators themselves. This means there must be a human-machine interface (HMI) or a supervisory control and data acquisition (SCADA) system in place that monitors and allows the operators to interact with the process or equipment. This interaction can range from simply monitoring and recording values to complete control and decision making for the process. The second category is normalization of data, meaning the reorganization of data into something that models the process from where the data is being acquired. For example, monitoring a trend on an HMI to understand the performance of a system over time. This data could even be coming raw from the sensor/algorithm directly to the operator. The analysis of data is the third category. The systems must be able to assist in decision making and keep the operators safe from tasks that may not be safe. The industries that require automation/smart factories can be dangerous and require extreme safety. The introduction of an automated process, controlled remotely, can increase the safety of the operators and remove them from a dangerous position. Lastly, the systems must become self-reliant over time. This will come from their data acquisitions and established protocols so that the operation can work smarter. A more reliable and automated system makes for a more productive process. The next steps in IIoT will change the way that people, factories, and systems work together. Throughout the next decade we will continue to see innovations in the way that devices, people, and systems are connected. The effort to employ IIoT software, hardware with embedded cloud capabilities, will improve the way people make decisions across the entire manufacturing enterprise. In the coming years, protocols, infrastructure, and standards will be further developed and enhanced. This will make it easier to securely collect data from sensors and smart devices on the edges of production and logistics for analysis and therefore change how production systems will work in the future. This data acquisition will allow for smarter and more efficient factories, transportation and logistics companies, and industrial production. The annual return on investment (ROI) that the industrial internet can provide will change the way industries work. The interconnected, automated processes will give companies who choose to invest in IIoT a competitive advantage, cost control optimization, increased production, and the ability to analyze their data for problems and places for improvement. Problems that factories encounter will always be there, but with better computational capabilities those problems can be predicted in advance, creating more uptime and thus more uniform stable production output. To successfully employ the IIoT technologies companies will have to adopt fundamental abilities within their enterprise. To ensure IIoT success, there needs to be a high degree of proficiency within the following areas; sensor driven computing/edge computing, analytics, and intelligent machinery. New connected technology and IIoT capable devices have enhanced sensor capabilities where sensors can store large amounts of “raw” data to the cloud. This allows analytics to crunch that large data so meaningful, real-time decisions can be made and relayed to “smart” machinery that use the information to better control the fidelity of any particular process IIoT is applied to. IIoT creates “real-time” decisions because cloud-based analytics can distill that data through a much more manageable algorithm that makes decisions faster. Industries are positioning themselves to utilize and apply IIoT connected technology in a way that will have long-lasting benefits to a wide spectrum of users and systems for the near and foreseeable future.